NEW YORK CITY — March 24, 2015 — For Immediate Release — While advertising and media outlets are notorious for featuring unrealistic, retouched images that contribute to poor self-esteem, the National Eating Disorders Association (NEDA) has created the NEDA Inspires Seal of Approval campaign to recognize those companies and individuals who are striving to make a difference, with the inaugural award going to the intimate apparel line Aerie. Much like the Good Housekeeping Seal of Approval has come to represent quality in lifestyle goods, NEDA hopes the NEDA Inspires emblem will represent social responsibility in advertising, image and editorial content – specifically, content that challenges the thin ideal and promotes diverse representations of beauty. The seal was the brainchild of Iskra Lawrence, 24, international JAG model who was dropped by her agency at age 15 when her hips were deemed “too big,” but was found “too small” by plus-sized reps at the time. Taking a leadership role for change in the fashion industry, Aerie – which recently celebrated the one-year anniversary of its #aerieREAL campaign – has made a corporate commitment to body-positivity in its advertising and marketing materials by pledging to no longer retouch models in any way. 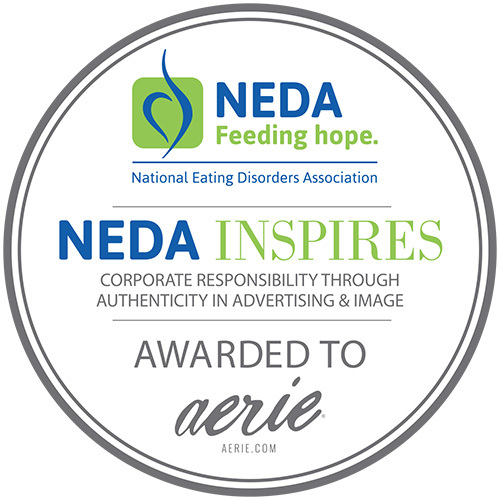 On Feb. 19, Aerie also announced a partnership with NEDA as the lead sponsor of the non-profit’s ongoing national walks awareness program, NEDA Walk. Save a Life., which raises funds for advocacy and educational programs, spreads awareness about the seriousness of eating disorders and provides support for the local community. NEDA holds more than 65 walks each year in cities across the nation. Sixty-nine percent of American elementary school girls who read magazines say that the pictures influence their concept of the ideal body shape and 47% say the pictures make them want to lose weight (Martin, 2010). Forty-two percent of first-to-third-grade girls want to be thinner (Collins, 1991) and 81 percent of 10 year olds are afraid of being fat (Mellin et al., 1991). The genesis of developing an eating disorder typically begins with a diet. Today, weight-loss is a $61 billion industry (U.S. Weight Loss & Diet Control Market, 12th edition), with an estimated 19 percent of adults and three percent of children in the U.S. on a diet on any given day (2014 Eating Patterns in America Report, NPD Group). Over half of teenage girls and nearly one-third of teenage boys use unhealthy weight control behaviors such as skipping meals, fasting, smoking cigarettes, vomiting and taking laxatives (Boutelle, Neumark-Sztainer, Story, &Resnick, 2002). Even among clearly non-overweight girls, over one-third report dieting (Wertheim et al., 2009). Thirty-five percent of “normal dieters” progress to pathological dieting and, of those, 20-25 percent progress to partial or full-syndrome eating disorders (Shisslak, Crago, & Estes, 1995). And, although treatable, eating disorders still have the highest death rate of any psychiatric illness (Arch Gen Psychiatry. 2011;68(7):724-731).